Wales has received a ‘call to arms’ to commemorate 100 years since the First World War, by sounding the bugle call for every household to search their family papers for Tommy’s Letters from soldiers who were serving at the Front during the 1914-18 conflict. NEVER FORGET YOUR WELSH HEROES is launching its campaign today (Wednesday 3 December) to find the hidden treasures, that have lain languishing in attics, garages, or boxes beneath beds, so that they can be shared with the rest of the nation in an unique archive to be created by the Friends of the Royal Welsh Regimental Museum, Brecon. The spark for the campaign came when Glastonbury Festival stars Rusty Shackle wanted to donate the proceeds of their song Tommy’s Letter to a Welsh military charity, to help people to remember the soldiers who suffered so much, but were kept going by the thoughts of their families back home. 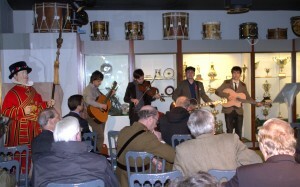 The band gave a special performance at the launch and read real Tommy’s Letters, along with Col. Tim Van Rees (retd) chairman of the executive committee of The Royal Welsh Regimental Museum. When it came to the First World War, Wales was punching well above its weight. With Lloyd George eager to show Wales at its patriotic best, the Principality contributed the largest number of men to the Services on a basis of percentage of population, than any other country in the Empire. Bringing archives alive with videos, the campaign wants the descendents of those who sacrificed their youth, their health and their lives for their country, to take selfie videos with their smart cameras, or sit in front of their webcams, and then send them all to NEVER FORGET YOUR WELSH HEROES to be published on a dedicated You Tube channel. For the camera shy, the options will be to scan in the letters and email; or photocopy and post, along with details of who the letters are from, including photos and mementos. This will translate into an exciting historical and educational resource, that will be available online, giving colour and that personal connection with the family heroes who fought to protect and preserve their homes and families. To find out to let your family hero letters paint a vivid picture of what the war was like, go to www.neverforgetyourwelshheroes.co.uk and follow the instructions. NEVER FORGET YOUR WELSH HEROES is looking for letters from all Welsh soldiers or those who served in Welsh regiments – as often recruits did not end up in the regiment of their choice, but one where there were holes in manpower. Many families who still have these letters will live outside Wales now. In 1914 the world was steam powered, and the best steam was from coal from the South Wales Valleys. “The centenary of the First World War is an important opportunity for us to pay tribute to all those involved and to remember their sacrifices and bravery. “We are proud to be leading Wales’ commemorative programme Wales Remember Cymru’n Cofio 1914-1918 and are pleased to see the enthusiasm of communities and organisations across Wales to contribute. The Great Depression and the economic death of the industrial Valleys, has seen a big migration outside the borders of the Principality, so the campaign is wanting to reach out to all those around the UK, to dig deep into their family history, and see what nuggets they can find. The NEVER FORGET YOUR WELSH HEROES campaign will support the Friends of The Royal Welsh Regimental Museum’s appeal for £1m to fund new research facilities and a new display area for regimental trophies and memorabilia of the recently amalgamated regiment.